Trunks: Erect; bark grayish brown, furrows shallow, ridges long; wood brown, hard. Twigs: Greenish brown to brown, rigid, glabrous or glabrate; leaf scars half-round; buds brown, ovoid, .12 to .24 inch, apex acute, scales often ciliate. Leaves: Deciduous, alternate, simple; petiole .24 to .8 inch, glabrous; blade lanceolate to elliptic in outline, 3.2 to 8 inches long, .6 to 3 inches wide, base acute to rounded, margins entire, bristle-tipped only at apex, apex acute to obtuse, abaxial surface light green to brownish green, sparsely tomentose, adaxial surface dark green, shiny. 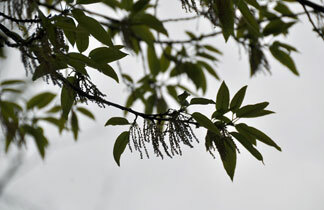 Flowers: Staminate catkins at base of new growth, 30-35-flowered, drooping, 2 to 3.2 inches; peduncle .2 to .8 inch; pistillate spikes axillary from new growth, 1-3-flowered; peduncle 0 to .28 inch. Flowers unisexual, more or less radially symmetric; staminate: sepals 2-6, connate, calyx lobes .04 inch; petals absent; stamens 2-4; pistillate: sepals 6, connate, calyx free from ovary; petals absent; pistil 1; styles 3. Fruit: September and October; acorns, maturing in second year; peduncle elongating up to .3 inch; cup top-shaped, .2 to .35 inch long, .4 to .7 inch wide, enclosing 1/3 to 1/2 of nut, scale apices closely appressed; nut dark brown, ovoid to nearly globose, .5 to .6 inch, minutely pubescent; attachment scar .28 to .35 inch diameter; seed 1. Habitat: Upland woods, ravines, floodplains, stream banks, borders of prairies; moderately dry to moderately moist soils. Uses: Ornamental shade tree. The wood was used for shingles, furniture, lumber, firewood, and wagon spokes. Native Americans chewed the bark for mouth sores, steeped the bark and applied the liquid to chapped skin and took it for asthma. The leaves were wrapped around dough when making bread. Comments: The common name refers to the wood being used for shingles. Shingle oak is not common in Kansas. It is our only Kansas oak with entire leaf margins. The nut is bitter and not edible.